In case you were wondering why I have disappeared from the blogosphere and have not added any new recipes for a little more than a month, here is the scoop: We decided to sell our house. As part of that, there was a lot of preparation that had to be done – cleaning the house, finding the broker, the paperwork and did I say keeping the house clean. Finally our house is on the market and it has been a few weeks since it went on sale. It’s really a chore to keep the house clean – we have to clean it up the previous night so that the mornings are easier on everyone. Also, I have to make sure I do not cook food that will spread the aroma or smell of the food around the house, depending on how you look at it. If I do cook with spices, I make sure I air the house out to get the aroma or smell out by morning! Anyway, long story short, now that we have got the routine down pat, I decided to start cooking again. So now I will “try” posting the recipes every Thursday again until we move the first week of April to a new place.
) in which she recommends making your own yogurt so that it is closer to the Indian version of the yogurt. In the book, she recommends making the yogurt with whole milk and heavy cream. I have not tried that but I intend to try that one of these days. 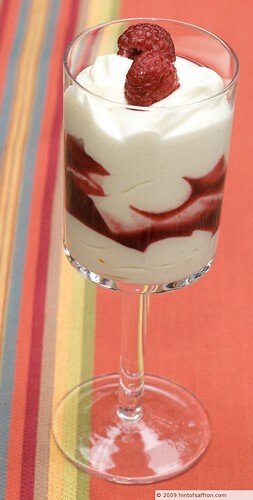 There have been suggestions from other blogs to add sour cream in order to get it closer in taste to the Indian yogurt. So I took the shortcut and added sour cream to the yogurt. I had to do multiple tries of making Shrikhand and taking photos that looked appetizing. The first couple of times, the photos just came out awful and I did not feel like posting them as they did not look too appetizing. Since I want people to try this recipe and want to eat it, I had to redo the Shrikhand the third time and retake all the photos again. I am happy to say I was very pleased with the results of not only the Shrikhand tasting really good but all the photos look appetizing. But then the readers of this blog are the judge of that. Please let me know what you think of the photos and also the recipe if and when you try it. It took me a while coming with better ideas of taking photo of a dessert that is nothing but mostly white in color with a sprinkling of saffron. I had a mental block of how I could take the photos until I hit upon this site which has amazing French dessert. She also takes amazing photos of her food. While browsing through her site, inspiration hit me on how I can do a fusion dessert and also take photos with it that look appetizing. 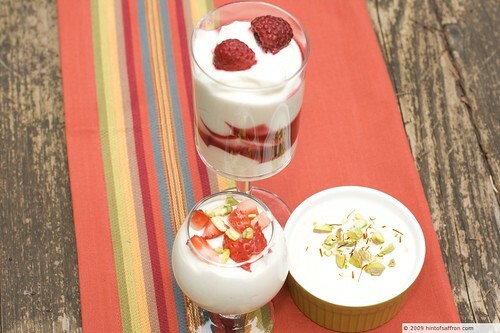 Also, apart from making the Shrikhand the traditional way, I decided to add a touch of fusion by making it in 3 different ways – the traditional way, mixed in with rasberry coulis and topped with strawberries and pistachio nuts. All the versions came out fantastic. You can even eat it with honey if you like. 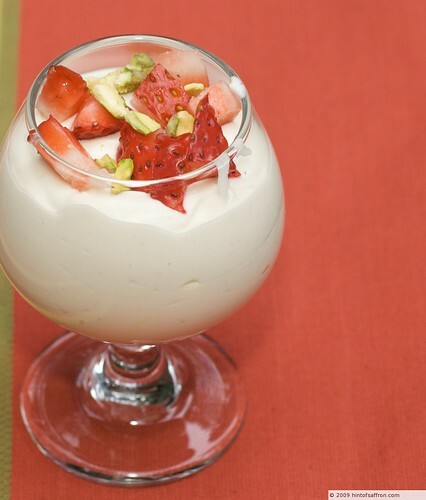 The one below is the traditional Shrikhand. The recipe is very simple. 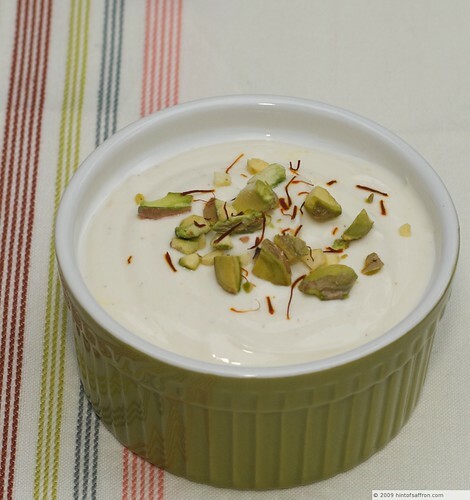 You can eat in various ways as long as you make the basic shrikhand as outlined below. Place the yogurt in a double or triple layer of cheesecloth (depending on the cheesecloth) that has been spread in a bowl. Tie the four ends together and then hang it overnight so that it can drain. I used a wooden spoon and hung the yogurt in a stockpot so that the cheesecloth does not touch the bottom in the refrigerator. The next day, the yogurt will be half the original amount. Transfer the yogurt to a bowl and add the cardamom, sugar, saffron and sour cream and blend it well with a rubber spatula. 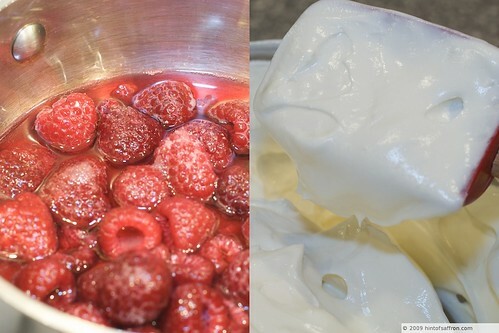 To make the rasberry coulis, put 1 1/2 cups of the rasberries, the sugar, and water in a medium saucepan over medium-low heat. Heat and stir until the sugar dissolves and simmer for 6 to 7 minutes or until the rasberries start to break down. Remove from heat and strain the mixture through a strainer to a bowl. Discard the pulp. You will get the consistency of maple syrup.